All organizations have projects they have trouble getting to. A look at the true reasons for these delays suggests a way to get the project “unstuck”. Most often, these projects are outside of the daily flow of activity and require nonexistent expertise or a decision for which the information is not available, or the approval of a skeptical authority. 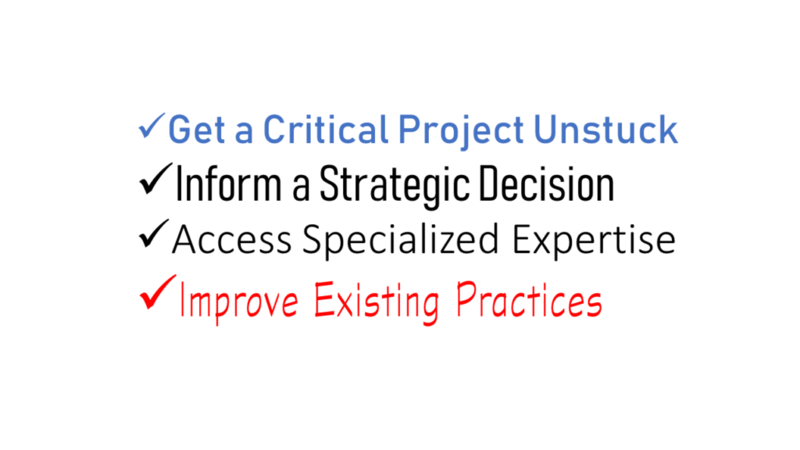 The right consultant can help with any of these and get the project moving forward. Invariably, those projects require a competency that is not core to the business, which leads to no natural owner for the project. Whether it is setting up a tool (CRM, business software…), setting up a new business activity (product development, sourcing acquisitions or technology to license…), or investigating an unfamiliar topic, the responsible individual can’t make time to learn to do the project. Recognizing the missing competency and hiring a consultant with this expertise moves the project forward without robbing time from other activities. The consultant solution avoids committing to hiring an employee whose critical skills might not be needed full time in the future and opens the door to continued contract consulting only as needed. Some strategic business decisions are so consequential that they deserve careful consideration. Such decisions can include a change in direction for a business unit, investing or not investing in a business line, whether to enter an area through organic growth, a partnership, or an acquisition… Using strategy consultants to identify and weigh the options can help choose the best path between competing alternatives. Strategy consultants have been exposed to enough strategies in varying circumstances to understand what works in different settings. Strategy consultants who have also been executives in multiple industries are rare and priceless in this respect: they can take into account execution when recommending a strategic path. Working with strategy consultants has several benefits: putting strategic minds on the task, focusing on the issue without the distraction of day to day activities, and providing an impartial look at the business. Internal alignment behind the decision and credibility with key stakes holders will result from working with strategy consultants. We were brought in to determine if an entity should invest in growing a shrinking but previously lucrative business line. We showed that the ROI on the multi-million dollar investment required for growth was insufficient. The internal debate was finally settled. All affected aligned behind the recommended path. Strategy consultants are often believed to be most valuable to Fortune 500 companies. In fact, strategy consultants have greatest value for small to medium size organizations, where the prevalent competency is execution, not the development of strategy. Any business area that is unfamiliar should be treated as a specialty. Investigating an unfamiliar market? Specialty. Setting up effective Marketing? Specialty. Set up a New Product Development process aligned with company strategy? Specialty. A small government contractor wanted to expand by building a commercial business from the ground up. This involved identifying target markets for its high priced and very specialized products. Hiring us for this task resulted in a doubling of company revenue in 8 years. An investor sponsoring cutting edge research at a university hired us to figure out where this technology would be applicable. We provided 24 distinct areas where applications of this technology could create profitable business. Sales, Marketing, and New Product Development are common areas where an outside review by a specialist can lead to substantial improvements quickly. territory AND a 10% increase in the reduced territory. This dramatic improvement required no other investment than the analysis. A company owner hired us to review their proposed Marketing plan. The review recast the plan to align with the company strategy and to focus on the 20% of proposed activities that would generate business. Market segmentation followed by focusing on the best markets and serving them well has yielded double digit growth in multiple companies. The more the consultants can integrate how the company strategy interacts with the practice, the more impactful the recommendations will be. Better yet, these outsiders will likely notice other areas of the business where a change you did not consider yields unexpected positive results. A simple pricing analysis meant to deliver a recommendation on where to raise prices also yielded a targeting profile for new customer acquisition to maximize revenue and profit from each account. A study to search new markets, in addition to yielding several potential markets, also delivered profit improvements, growth acceleration, and higher valuation through the implementation of a New Product Development process in line with the company strategy. Sometimes, you need to make a new hire to permanently add skills or capacity to the organization. However, whenever determining how to meet the actual need is proving challenging, consider hiring a consultant. This is a smaller commitment that will likely yield exceptionally positive outcomes.